Yes – in life, it is all about keeping our beloved pets happy and content…and above all, healthy! Freezy Pups’ creator, Heather Klemm felt the same way. As a professional dog trainer, she was inspired by her own dog family and a passion for serving the needs of the discerning pet owner. Tasty and affordable treats are always top of mind for those of us who love to spoil our canine companion….and the Freezy Pups Treat tray fits the mold…literally. Dog owners…there is no need to feel guilty when enjoying a favorite indulgence… like a rich and creamy ice cream cone or a pint of Ben & Jerry’s especially during those hot summer months. Now, you can offer cool frosty relief to your furry friend direct from your home freezer. Freezy Pups Treat – is an unique organic dog treat recipe kit that is founded on the philosophy that good fresh ingredients (wheat, soy, and gluten free) served in fun and reusable packaging equates to a Happy and Healthy Dog and… dog owner. The Basics: Fill and Freeze a special durable tray made of recyclable materials with one of four nutrient-rich broths (included in kit). White Cheddar Cheese and Chicken Soup are favorites. End Result: 56 frozen treats in the shape of a bone (based on Freezy Pups kit with 4 mix pouches). How To: Just mix a packet of one of Freezy Pups’ many recipes with water; freeze in the signature cool bone-shaped tray and serve. Don’t be surprised to see neighborhood four-legged guests stopping in to join in on the Freezy Pups’ frenzy. Head of the Pack’s business model is based on economic reality – in short, a good product at a good price …sells! Although less than six month’s old, the company has already made its mark in a competitive market; the product line recently won “Best in Show in the Natural Pet Category” at Global Pet Expo 2011. Head of the Pack’s commitment to healthy ingredients and value keep consumers coming back for more. 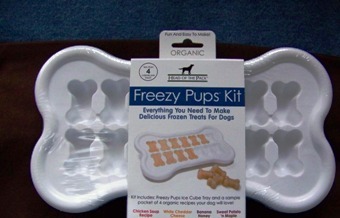 You can order a Freezy Pups kit for only $19.99 plus shipping. For special savings – up to 15% off your first order – visit the Freezy Pups Treats Facebook Fan Page. Perfect! We provide our pup the doggie ice cream in a cup after a bath as a treat. She also loves to watch the ice dispenser for wayward chucks of ice, but it is just too hard for her to crunch sometimes. This treat would be perfect for both situations, what a great idea! My dog digs the idea!